There is a stoic melancholy about Cleethorpes; as if it were making the most of the 'now' whilst reminiscing of past glory. Back in the Victorian days, Cleethorpes was marketed as a popular seaside town, especially for those in nearby Yorkshire. Whilst tourists continue the come across the Humber even today, it hasn't quite made it to the popularity levels of some the more southern seaside resorts. 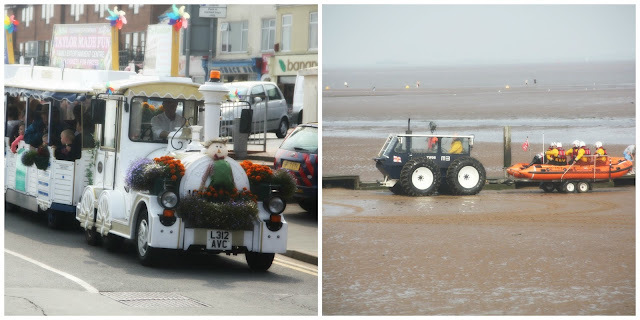 However, there is an certain authenticity about Cleethorpes that is strangely captivating. We are up north every so often to see family and a walk down the Cleethorpes promenade is a popular routine. I love the Sunday market near the pier has some great bargain 'seconds' from the likes of Karen Millen, Minuet Petit etc . 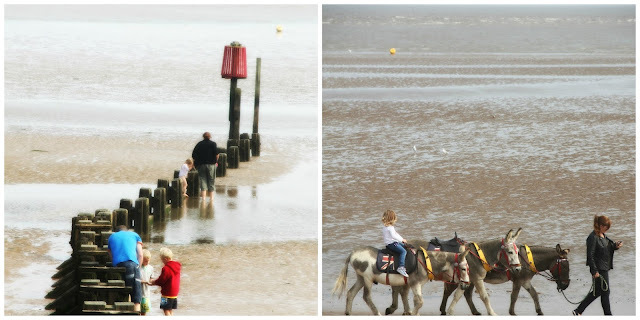 The views of the tide coming in and out, the picnic parties braving the chill winds for some fresh seaside air, children on crabbing expeditions, horseback rides along the beach, Cleethorpes seafront life is the epitome of making the most of whatever is on offer. Like most English seaside towns, Cleethorpes has its share of attractions. The light coast railway and the Lollipop road train rides, slot machines, fish & chips and ice cream vendors, giant snakes & ladders and hopscotch, and the usual load of fun 'tat'. I'd also recommend checking out the Captain's Table restaurant for some really good quality seafood. If you are a geek like me, you can even browse through 'technical' details of the fish species on offer before you make your choice. Cool late summer walks by the seaside call for weather-appropriate fashion. I'm wearing a favourite sequined t-shirt (borrowed many years ago from my little cousin and surprisingly still fits), along with a pair of black jeans and my go-to blazer from H&M to keep off the chill. I believe that not-so-sunny days require a strong dose of happy-colour to make them better. Wearing boutique SRC t-shirt ( Made in India), Zara jeans, H&M tailored blazer, ASOS leopard flats and Marc Jacobs crossbody bag. I love cleethorpes! We used to go for a bit of a beach day out when I was at uni near there! Love a bit of old seaside town, fish and chips on the beach, hot donuts, making sandcastles and finding a crazy golf course. Love all of it!